Mars Bank and the Butler Radio Network presented a check for $3,200 to Veterans in Need of Butler County. The bank and WISR, WBUT, and 97.7 The Rock Station donated as well as raised funds at community events, the Veterans Day Parade in Butler, and at Mars Bank locations. Veterans in Need provides emergency assistance to veterans in Butler County. This is the second year that the Mars Bank sponsored Step Forward Campaign raised funds for Veterans in Need. Harry Austin, Mars Bank Director presents a check to Veterans in Need. From left to right: Tracie Williams, Vice President, Mars Bank; John P. Cyprian, Director, Butler County Veterans Services; Roy Remone, CCP, Veterans in Need Board Member; Harry Austin; Rex Brown, Veterans in Need Board Member; Tyler Friel, Butler Radio Network. Veterans in Need was founded in 2016 to provide emergency assistance to veterans who suffer sudden loss of income or emergency. Funds are provided for everyday essentials that are beyond the individual’s ability to meet. The organization also operates a furniture warehouse which provides household goods to veterans. Any veteran honorably discharged and with a valid DD214 or other documentation may apply for assistance. Visit www.bcvin.org for more information. 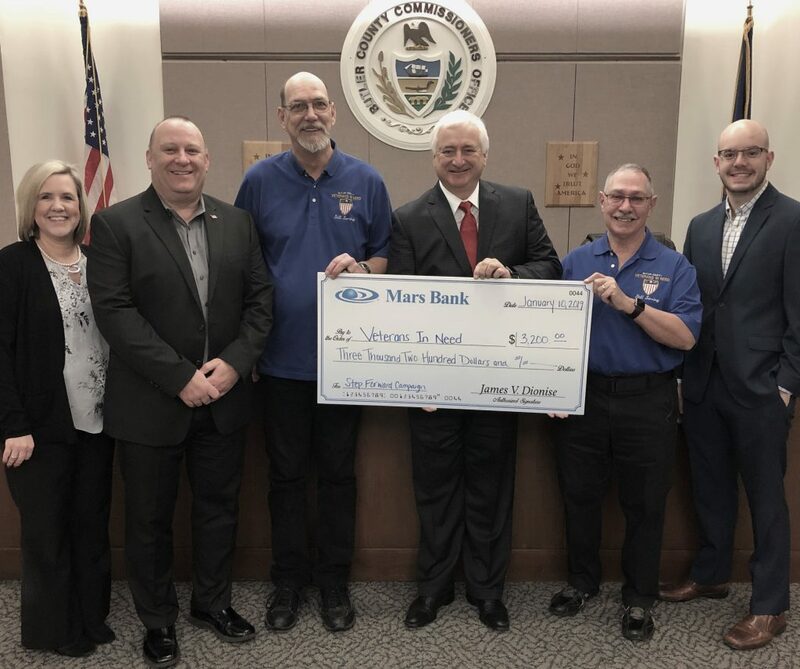 Mars Bank supports Veterans in Need as part of its Step Forward Campaign which promotes and supports first responders, active military and veterans. Mars Bank is one true community bank focused on combining the products and technology that its customers need while maintaining its focus on long-term customer relationships. Read more about the Step Forward campaign here.